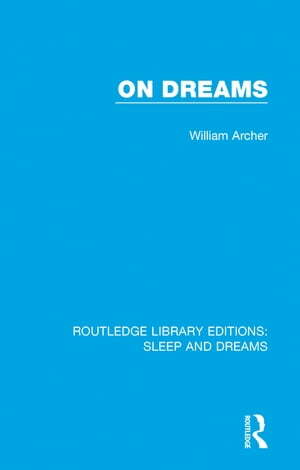 Collins Booksellers - On Dreams by William Archer, 9781315312392. Buy this book online. Originally published in 1935, William Archer’s interest in dreams had persisted for over quarter of a century, for ten years of which he kept a careful record of his own dreams. These records alone form a valuable collection of material, of which Archer made good use in the writing of the book on dreams on which he was engaged at the time of his death; large parts of these dream-records are reproduced in this book. He left this book partly finished, partly in draft, and partly in the form of notes. In putting together this material the editor, Theodore Besterman, tries to carry out Archer’s intentions as closely as possible, and believed that he represented the book as he would have wished it to appear. It was unquestionably an important contribution to a difficult subject at the time, the result of many years’ study and reflection.